Written on May 31, 2016 . Posted in Announcements + Updates, Graduate Studies. 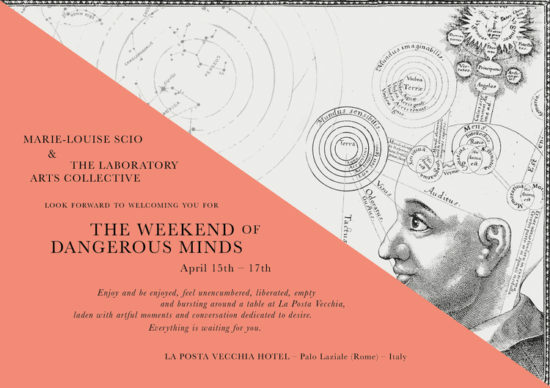 Lisa Z. Morgan (Lecturer, Digital + Media) recently gave a talk called Pushing the Pink at the Laboratory Arts Collective meeting entitled ‘The Weekend of Dangerous Minds’ organized by Marie-Louise Sciò (BArch ’00). Morgan’s talk combined readings, musings, and propositions themed around the concept of Desire. To contemplate the space that lives with-in where desire and creativity originates. What is the scale or expanse of this space and does this correlate to the capacity required to conjure/pursue/build upon an idea? What was the first object of desire and does this in any way connect with what you do now in your creative work/output? Prior to the reading a small grey box was brought into the wood paneled library on a silver platter and placed on a high shelf to the side of me. This box contained a bottle of the perfume that I created as an art piece in 2001 entitled “Pink-ness No. 6” In describing the scent, I asked the audience to imagine how the perfume might smell. The bottle remained sealed and could not be inhaled. It became the physical representation of Desire.